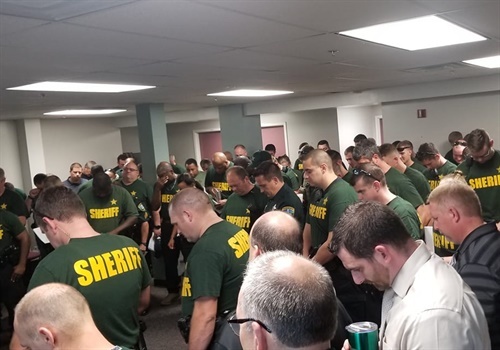 The Leon County (FL) Sheriff's Office posted a picture to Facebook showing deputies bowing their heads in prayer as they braced for the imminent landfall of Hurricane Michael on October 9, 2018. Image courtesy of Leon County SO / Facebook. The Leon County (FL) Sheriff's Office posted a picture to Facebook showing deputies bowing their heads in prayer as they braced for the imminent landfall of Hurricane Michael on October 9, 2018. "And so it begins," the post said. "Our Bravo shift pauses for a moment of prayer, before weathering the storm. If you don't mind, say a prayer for all of the men and women working to keep our community safe." Citizens commented on the post things like, "Lord protect our protectors" and "God go with them." Hours after the Facebook post went up, Hurricane Michael made landfall near Mexico Beach, Florida.